This book is very approachable and has excellent diagrams and photography.Compare these photos to the dingy B&W stuff from the library books we looked at and this book wins hands-down. My 9 y/o son has been reading and doing the projects (I've been working along with him). The PICAXE project worked on the first try! The author uses an outdated analogy of electricity using a water tank to represent the batteries, and its this analogy that probably causes him to get the definition wrong on some physical quantities. I don't think it will cause any problem if your are just interested in hobby use and not interested in theory, however if you want a more accurate understanding of theory I would suggest that you look at a physics text. Or at least look up the terms on wikipedia. In case you're interested here are some of the errors I found, (but I really would recommend that you look it up in text or on wikipedia where the subject is explained more clearly and in more detail): on pg 36. He started by saying that electrical potential is measured in coulombs and is a measured by adding up charges, while it is true that coulombs are a measure of charge, electrical potential is NOT charge - the difference in electrical potential between to points is commonly referred to as voltage, and what is it measures is how much a charged particles electrical potential energy would change if moved from the first point to the second point (so 1 volt = 1 joule per coulomb). If you want to use a fluid analogy in a circuit the charge stays on the conductors so they are like pikes, so you would have to picture a closed fluid system. Voltage would be analogous to height, electrical force would be analogous to the force of gravity or weight. The battery would be analogous to a pump, that would lift the water to a certain height, and the water flowing down through pipes is analogous to the circuit. So just as when water drops in height it converts its gravitational potential energy into other forms of energy such as drag (resistance) to do work (like a light bulb or a motor) or to kinetic energy. The electrical analog to fluid flow rate is current (measure in units charge per units time, 1 ampere = 1 coulomb / second). A watt is NOT a measure of energy, a joule is a measure of energy (and a volt is 1 joule / coulomb) watt is a measure of power (think horsepower) and 1 watt = 1 joule / second. Work is a measure of a force through a distance and is measure in newton meters, but here is the key: work doesn't come out of nowhere, energy is used to produce work, so 1 newton meter = 1 joule ( if you want to derive them they are both kg times (meters squared) over seconds squared). Another thing he says is that if you put to batteries in parallel it doubles the current but this is violation of Ohms law, if the batteries are in parallel the voltage is the same as if you had just one battery so by ohms law V=I/R if V is constant then R is constant (because real batteries have internal resistance, if that is the main source of resistance in your circuit, then yes the current would effectively double but in a typical circuit the batteries internal resistance can be ignored, and current would remain roughly constant) What generally happens if you hook up two batteries in parallel is they would last twice as long as if you had just one since each battery stores roughly the same amount of energy in the form of electrons stored in the chemistry so by using double the batteries you double the number of electrons available and by Ohm's law you use the electrons at the same rate (current aka amperage). Ohms law also explains why if you have near zero resistance (even wires have some resistance) that your battery drains really quickly, the current goes up since there is little resistance to keep the electrons where they are, so basically the electrons leave the battery as quickly as the chemistry in the battery is capable of releasing them so the battery drains very quickly, its this huge number of electrons moving through the wire in a relatively short amount of time that cause all the heat. 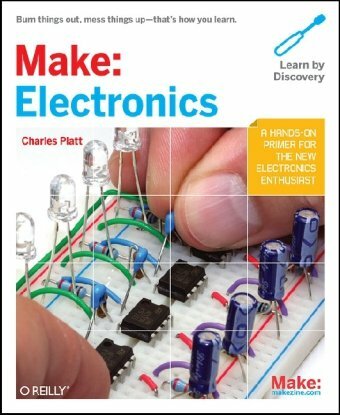 I got this book thinking I knew the basics of electronics.Well, I didn't.This book takes you back to basics and builds your knowledge from that CORRECTLY.Amazing book! Where was this book when I was in college or before even that?!!! Here am I, over 30 with aMaster's Degree in Electrical Engineering.I pick up this book because one day I would like to teach my son electronics, and before that teach some homeschool classes in my area on electronics.I was completely amazed at how well this book is laid out for teaching someone new to electronics!I remember my earlier days in junior high when my techie granddad gave me an electronic kit that sat on my shelf collecting dust, because the manual was just awful.I sure wish I had this book back then!I would have also have made a great introductory electronics class in college, instead of all that boring theory the professor droned on and on about all day then go to lab and stare at the breadboard.I made straight A's in those early classes, but not very confidently and no thanks to the professor. The books does a wonderful job of building upon concepts and moving onto the next without jumping too far out ahead.It has some nice historical asides in the sidebars about inventors and scientists for a special touch.The downside is getting all the parts for the experiments, so I recommend you cough up the dough to get the Maker's kits that go with the lessons if you don't want to spend a lot of time ordering and searching.However, ordering and searching for those parts is another education in itself, because one must eventually learn to acquire these items if they want to do more electronics work in the future. Overall, this book is worth the money! This book is a great guide for the novice or seasoned electronic technician. Although it starts quite basically, it moves into more complexity as the pages progress. It is easy to read and the questions at the ends of the chapters are akin to pop quizes we had in high school. These define whether or not you need to review the past material or progress to new territory. Over all, it is a very good text from which to learn electronic theory with practical applications. One thing that I like about this book is that it gives you something that is very important PRACTICE. I have not yet read the whole book, but I'm in chapter six, and so far it's been a great book. I also like the fact that it has amathematical approach yet it does not go beyond algebra (there is actually a tiny bit of trigonometry in chapter six, but I was still able get by knowing pretty much what was going on). Overall an excellent book. I have the older 2nd edition. Apparently the 3rd edition is even better. 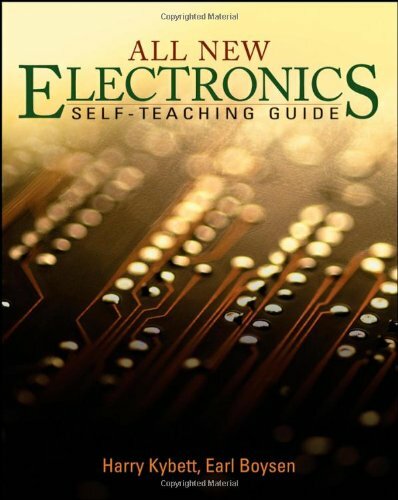 This book will teach you the basics of electronics components and math as painlessly as possible. 1. Tell the student what s/he will learn in that chapter. 2. Give the student the information a step at a time. 3. Ask the student to use the info to solve a problem, again one step at a time. 4. Give the student the answer immediately (no looking in the back of the book). This system works remarkably well. Also, I feel that this book makes good choices with regard to how much math to include. Equations that can be derived with basic algebra are derived and then used. Equations that require higher math to derive are not derived but are explained and used. This is a sensible balance. You come out of the end of a chapter with specific, concrete, usable knowledge and a good deal of confidence. Your knowledge of electronics simply grows and grows. It is the best electronics teaching system I have ever seen. Buy it now. It's the right thing to do. 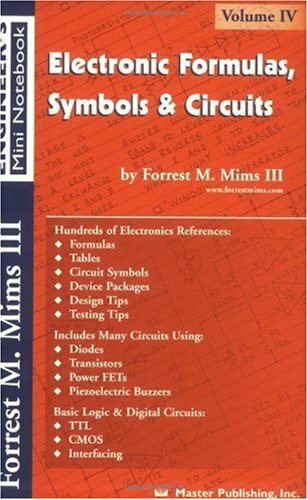 This book is very helpful for understanding how circuits work. The question answer format really helped me see how electronic circuits work. This is much more effective than the more theoretical books. I would recomend this book to anyone trying to understanding how electronic circuits work. The basic design and direction of this book is absolutely excellent.The question and answer format engages the reader for better understanding, and the topics covered include a wide variety of essential areas.The book falls down, however, because ofbeing 'rushed out without adequate editing' (nor usable index), thus leaving the reader confused at times. Other problems include incorrect answers to problems, and inadequate explanations.So while I know that I learned a lot from the book, I also know that if I recommended it to friends they would be calling me saying how frustrated they were with the mistakes.For that very reason my review is not a recommendation.I have strong hopes that the next edition will fix the problems here and I will THEN be able to recommend this book. In case you are wondering (and I know I was), the third edition is actually written by Earl Boysen now since Harry Kybett, having written the first two editions, has passed away. The Q & A format is one of those things that always seems to be a bit unique in any particular book, and this one is no exception.In the early chapters many of the questions may seem insulting in that they are so easy, and the reader can find themself wondering if the book was written for 8 year old kids! But the real beauty of that approach is that it forces your mind to change modes on a regular basis: instead of staying in a passive info-absorbing mode, it has to stop and become active at solving a problem, which results in better retention. So even if the question seems childish, the information is more firmly impressed on you.In the middle and latter chapters, the Q & A format usually sticks with problem solving, often asking you to repeat the same sort of calculations you have seen in examples. Most of the time the solutions include more than just answers, serving to explain just how the answer was arrived at. But the problems occur with that word "most"! It is also the case that many of the times when we need details, all we get is a numerical answer with no hint as to how it was arrived at. It is even more frustrating when the book's answer appears WRONG no matter how many times you recalculate it. In addition to the Q & A presentation, the end of each chapter includes review questions along with answers, but no detailed solution.One clear editorial screwup is apparent where Chapter 1 calls this"pre-test" and all other chapters call it "self-test." That's why I say "rush job". I found myself confused with the authors presentations on occasion and felt it necessary to consult other electronics books.Two I found particularly helpful were "Teach Yourself Electricity and Electronics" by Stan Gibilisco, and "Electronics for Inventors" by Paul Scherz. Both of these guys' books are a lot more "wordy" with an emphasis on making electronics undestandable.While this book is supposed to demystify electronics, I have to say I felt mystfied enough to go out and get these other books.Three things Boysen's book were unclear about are: ground line in circuits, which doesn't even show up in the index and is assumed to be something the reader knows beforehand; combining AC and DC in the same circuit (way too brief); and the emitter-follower amplifier - the description was just plain baffling!. This book does a great job of covering things like amplifiers, resonance, power supplies, along with AC and DC basics, but of course you have to start with fundamentals. Kirchoff's voltage and current laws are covered, but this books stops short of giving you a full complement of circuit analysis tools. It would be much better to have the method of loop currents presented here since without it, readers will be left scratching their heads when they run into many real-world circuits. Another big plus is the list of internet references that are provided in the book. The author has his own website and you can send him questions about the book; I did that and got a response every time. The book does have some experiments (five total), but they will require some equipment.At a minimum, you will need a breadboard and two digital multimeters, but normally you will also need an oscilloscope and a signal generator. Two of these experiments are called "optional" and are in the chapter on oscillators.I would not expect anyone to be able to perform those last two experiments simply because sufficient information is not given. The components are not specified and the author basically just suggests that you try to implement what is shown in a circuit diagram rather the providing the details (as he did in the other experiments). I think they are called "optional" because the author opted out! I would have preferred to see more experiments, maybe minimum of one per chapter?, and some alternative way of doing them without the expensive equipment. An amazing intermediate electronics book for non-linear thinkers. This book is not for everybody. If you want complete mathematical rigor, look elsewhere. If you want everything tightly organized and fully indexed, this is not your book. If you want to memorize rules rather than expand your thinking about the subject, you won't like this. This is not the best book for absolute beginners, either. The introductory chapter is weak compared to the rest of the book. Nor is it for those seeking up-to-date reference information. Almost all of the reference data is long obsolete. Much of the info in the microcomputer/microprocessor sections is too. It is also not a cookbook, despite what some other reviewers say. There are very few complete circuit designs. This book is, however, PERFECT for those that think non-linearly and rely on *understanding* rather than *memorizing*. 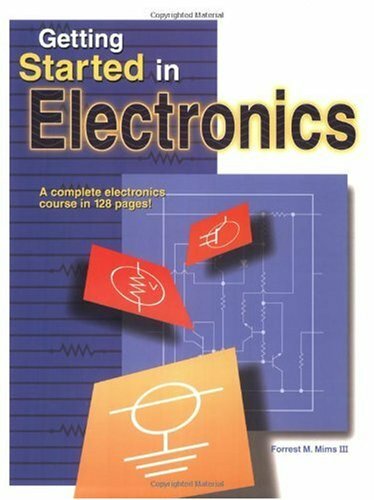 As the title promises, it teaches the *Art* of Electronics. It is not a dead collection of facts and equations, but a book-long exercise in internalizing the thought process that goes with good,creative electronic design. You will need other books to complete your education in electronics, but this book can be the key that makes it all "click". I read this book several years ago.AS a matter of fact, one of my friends at the University owned it and well this book is excellent will teach you on a very direct and simple language how electronic components work , and the diverse applications on real life applications and devices. Got this book as a reference on electrical components in experimental applications and I am very pleased.Everything one could ever hope for (except cookies) are included in this book, and it has already helped me create quite a few components which I most likely would have made errors on otherwise. The section on Op-Amps is especially comprehensive. This was a used book I bought to replace one that got damaged. The condition of the book was a little rougher than description indicated. A picture of used books wouldbe helpful. 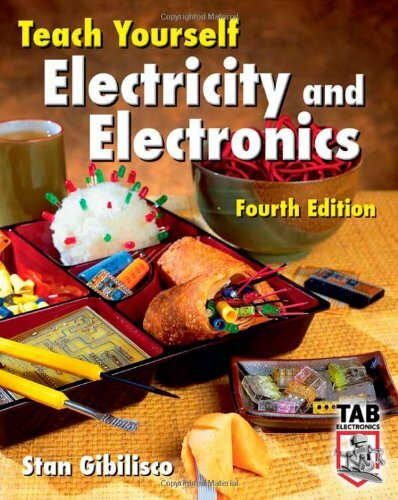 This is an iconic book in electronics even though itcould use an update, it is very thorough and helps the understanding of basic electronics. It has a lot of examples of DO's and more important sometimes DO NOT's. Electronics is fascinating – want to make something of it? This book shows you how! The content is easy to follow, especially for someone who does not know much about electronics. It works for me. I was looking for help on using an oscilloscope as well as better understanding simple electronics, and the "dummies" series books are in my opinion very helpful and simple to understand. This book really is good. if you really want to understand how the components work in an electronic circuit, I recommend this book. This book is not for the expert technicians because it cover's the really basic stuff like, resistors, diodes and so on. I have an electronics degree and after 25 years I wanted a refresher course.This is a good basic electrical/electronics book. I bought this book at the spur of the moment for something light to read during a long commute.All of the Mim's books I have read are all very well written and easy to understand.I have a degree in Mechanical Engineering which included some electronics curriculum, though I am trying to learn more.This book was a fantastic refresher and actually explained things in such a wonderfully simple way that some concepts will be sunk into my mind better than in the past.I have also read Electronics for Dummies, which is also good.If I had to choose one or the other I would lean toward Mim's book.His illustrations are a blast. Forrest Mims is the best! Highly enjoyable read with a wealth of information packed into just 128 pages.Hand-drawn illustrations fill every page.100 interesting circuits to build at the back of the book.Read it and re-read it! Great starter book, highly visual, not updated in two decades??? Forrest Mims is the man when it comes to conveying basic electronics.I like his style of presenting the material in a brief clear and concise way.The drawings are top notch! This book is excellent for all ages, so no fear in grabbing this book and thinking it is "for kids". My only issue with the book is it really hasn't been updated in two decades.Can you believe it?With the explosion of newer electronics on the market in recent years and it hasn't even been revised and updated. ARRRGGGHHHH! Anyway, don't let that steer you away because everything contained in the book is still relevant today! NOTE: A more complete "teach yourself" complement to this book is the "Electronics Learning Lab" from Radio Shack.It looks like a kids toy but, for about $69.00 you get a great kit for building circuits that demonstrate all the material he explains in this book.Additionally, the Learning Lab comes with TWO additional Forrest Mims books on Analog and Digital Circuits.Both books are written in the same easy to grasp style as this one. This book went right along with another book purchased earlier for my son who is taking electrical engineering.This book was in good shape and saved me a lot of money buying from amazon.com rather than purchasing through the college book store. Great book on circuit board electronics. The best combination self-teaching guide, home reference, and classroom text on electricity and electronics has been updated to deliver the latest advances.Great for preparing for amateur and commercial licensing exams, this guide has been prized by thousands of students and professionals for its uniquely thorough coverage ranging from DC and AC concepts to semiconductors and integrated circuits. I have a high IQ (until like a few years i'll get Alzheimers and try to eat my styrofoam cup instead of drink the coffee). I can say that I understand it, but really, it goes MUCH faster than professionals learn it in school.It is very good, but starts to accelerate a bit more than any other review noted. There arent any books for people who are true starters.You might as well get this and be less frustrated than other books.You need to get a practice kit or something.However no author tells you what to get in advance.The bench is more important than the books, something this book sorta hints at but doesnt really give you suggestions on materials to self learn.It is working though! One question I had on Chapter 13 is Stan does not describe how to get the frequency by itself in an equation when inductive reactance and inductance is known. I was unable to answer Question 6 or 8 on the review for Chapter 13, "Inductive Reactance. I bought his Algebra book to brush up on my skills since I will be working in electronics. Other than that it was a good book, however, more emphasis on math will be needed. I'm no electronics pro, and honestly I haven't even finished reading the book yet.But I really like the lay-out and quizzes at the end of each chapter.One of the things that caught my attention was how it started with such basic information. "Chapter one; Atoms", this was a great and logical place to start.Keep your calculator handy though, because by chapter two you're knee deep in, what was for me, pretty advanced calculus. I purchased the Kindle version, in an attempt to get into some small electronics projects. The Kindle version has one major downfall: The table of contents is utterly useless. The publisher decided to make the contents one big image, without links. This makes the book have VERY limited utility for those looking to use this later as a reference. It also makes jumping back to previous chapters to review concepts a major chore. This book covers the relevant topics of DC / AC electronics, the major physical components, and the mathematics involved in a straightforward fashion. This intuitive, applications-driven guide to electronics for hobbyists, engineers, and students doesn't overload readers with technical detail. Instead, it tells you-and shows you-what basic and advanced electronics parts and components do, and how they work. Chock-full of illustrations, Practical Electronics for Inventors offers over 750 hand-drawn images that provide clear, detailed instructions that can help turn theoretical ideas into real-life inventions and gadgets. Practical Electronics for Inventors takes you through reading schematics, building and testing prototypes, purchasing electronic components, and safe work practices. You'll find all thisin a guide that's destined to get your creative-and inventive-juices flowing. I bought this book to prepare for an advanced physics course in ASIC chip design.I plowed through it in a tight 5 week schedule.Just like the professor said, there are lots of mistakes in this book.But this book goes from electrons to computers.It's strongest section is the part on electronic circuit components.It discusses components at a very detailed level extreemly useful for the inventor.I'm an inventor.It's important to understand the different types of batteries, resistors, capacitors, and other components in order to properly apply them to a given job or invention.This book really, really shines here!It also jumps into math beyond what knowledge I have, so it does not hold back on the essentials.However, the very difficult math is restricted to just a small area of specialized AC waveform analysis.I had to skip that section, but the rest was quite useable.The author wisely skips lightly over details not needed by most.For example, Boolean Algebra is treated adequately, but not in detail.The author rightly states that such derivations are now done best via computer programs.But an engineer would have to know the math in detail in order to trouble shoot problems in digital design.But this is a book for inventors and most of us, and not for electronics engineering students, except as a great survey of electronics from A to Z.The same professor who says this book has a lot errors, and it does, uses this book as a text for teaching electronics to advanced physics students! A worth while book. All the reviewers who point out the numerous errors in the book are absolutely correct.I believe, however, that they fail to realize the true utility of the book by trying to use the book as the main or only source of info.They should realize, instead, that the book intends only to be the starting point.Use it for its significant breath to shine light on new or unfamiliar concepts before digging deeper using other more detailed textbooks.Believe me, such a top-down approach is invaluable for someone who needs to actually get something built or modified in a hurry. Great book I highly recommend it to any one interested in building electronics projects. I'm the kind of person that needs to know how things work and am not satisfied just knowing that things work. This book answered all my questions. This book presents the material intelligently and comprehesively, but many of the examples and some of the descriptions are riddled with errors.There are errors in basic mathematical calculations.There are errors on reference points (e.g. R2 vice R3).There are mismatches between values provided in an illustrations and and values provided in their descriptions. The number of errors makes reading the book stilted, because you have to often pause to determine whether you are not understanding an explanation or you have once again discovered another error. I could see using this book as a text for a class and adding the challenge for students to identify errors as they discover them.It makes the text itself a form of quiz or test.Not ideal but it could be interesting. Overall for a technical book, it is poorly edited.Anyone who could plug numbers into a calculator should have been able to discover a majority of the errors.Anyone with a little common sense should have recognized all the inconsistencies between descriptions, examples, and references. Good presentation and a comprehensive coverage of the material, but a terrible attention to detail. I am a mechanical engineer and I was looking for a book on electronics that insulted my intelligence. Sure enough, this book delivered. The figures alone do a wonderful job of explaining circuits. Reading the actual text is almost unnecessary. The writing style is very informal and unscientific, which is probably not a bad thing. As for the math, it did not take me long to spot an error, I just got it today. There was a misplaced negative sign on page 75 which did not make any sense. Other reviewers have found issues with the math. For me, I am pretty well trained in engineering math and I already had a reasonable grasp of linear circuits (not nonlinear circuits), so I am willing to overlook these flaws. This is "practical electronics for inventors" and not "practical electronics for engineers and mathematicians". Great book, almost like a technicians notebook! This book is filled with practical knowledge!Applicable immediately to whatever you are trying to fix.There are a lot of "quick and dirty" test circuits to build that will help you diagnose and troubleshoot circuits. Only a few chapters into the book I already see it's potential.I only wish there was an updated version covering some of the newer electronic devices.Very useful to the hobbyist as well!! Purchased book used.Advertised as in "good condition" on Amazon.In actuality, the book is in excellent condition. 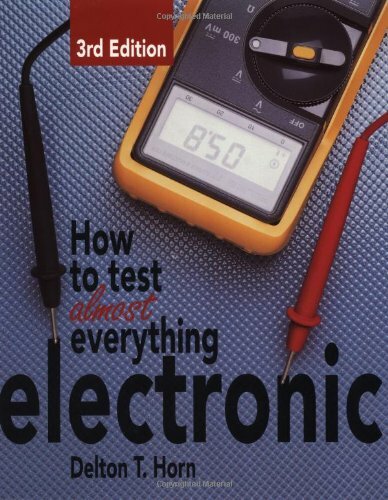 Although, somewhat dated, copyright 1993, it now could be retitled, "How to Test Not So Much Everything Electronic", it does contain much useful information.I am especially happy with the current test methods outlined for power supplies and transistor bias. OK, so I'm new to electronics. But for this not being a reference book, I sure learned a lot. Not just about electronics, but some really useful things. Like how to not blow up caps when you test them. There's a lot of good info here for a novice like me. Well done. books on the subject at the same time and found this book and Electronic Trouble shooting by Tomal and Wimer to be the clear winners. Great book,very easy to understand, a technician can't do without.It helps me a lot to review what I have learnt 20 year ago without having to deal with the math etc. You can't do much of anything with the projects in this book unless you are willing to spend about $500.00 up front to buy parts from the author's company. Of course, you don't find this out until you start to read the book. Save yourself the $16.95 and don't even go there!!! I'm an inventor and bought the book for use in designing an invention.Most would find it interesting.Need to have electronics experience to actually build these circuits.Mostly contains various high voltage types of devices.Some put out lethal levels of voltage and or power.Kids should use this under supervision.Some of these circuits will do more than make your hair stand up.Several could put the heart into fibrillation (I'm a doctor). For someone who knows what they're doing, this book can be a lot of fun. If you want to go from components to soldering to get a safe fun toy this isn't the book for you. Yes, if you use the author's website as your sole part source this book is quite the ripoff. However if you use your own PCB, and wholesale parts (or better yet parts from old stereos etc.) you can build the projects for under $100. Money aside, although these projects are fun.. they can be time consuming, and downright dangerous. Some of the high power projects contain more than enough power to kill you or someone else with ease. Bought this for my boss's son who likes to take her home appliances apart.He thought this was the coolest thing. This book is great for Electrical Engineering students. I hardly ever find myself wondering what the authors meant because of the very simple and clear writing style used in this text. I think a bit of colour in pictures and circuits would help visual learners such as myself but I'm not complaining. It's black and white start to finish but the method of explanation makes up for this one quirk. All in all, it's a great book and I think I'll be keeping this book forever as reference and not sell it like most of my other engineering textbooks. Shipping to Canada was also very fast (3days). I use this book to study fow a Power Electronics course. It is a good book and lightweight. 5 stars. Bought it directly from Amazon. Good shipping conditions. I will work hard to sell this book soon.Understanding Power Electronics needs understanding of output waveforms of circuits.A sine-qua-non of waveform study is to be presented with diagrams that are clear and easy to understand.In this aspect this book is junk. 'A picture is a thousand words' so the saying goes - I rest my case.What do you say about someone who draws a voltage and a current waveform in one diagram?Or several voltage and current waveforms in one diagram?Vs, supply voltage, Vd, diode drop, Vo output voltage, everything in one diagram and they overlap to say the least and also all in the same color - black.Sloppy and Lazy just about sums it up.These idiots think that such concepts are so simple that one need not sweat it to present them in a more clear fashion.It is evident that these people dont teach for a living - they do research and ask their TAs to do the teaching.One more caveat, dont buy the book written by that other fellow Dr. B.K.Bose.He too I am sure is stuffed to the gills with knowledge and wisdom a la Dr.Mohan here but his ability to present concepts in a simple manner with clear pictures and diagrams also is very suspect.Another $100+ went down the drain for me.My search for a good Power Electronics book goes on.If anyone knows of a good book please help.How much does it take to explain a simple rectifier and inverter circuits?Ye Gods. Great book with excellent questions and thorough analysis of basic analog power circuits and their uses. This is a great survey of power electronics for someone with a modest electrical engineering background. It presents terminology, hardware, circuits and analysis in an approachable and well organized way.After reading it, someone with little prior experience can have a clear sense of what the field is about, what devices are available, and what technology is appropriate for specific power and voltage levels. The book was in a very good condition, I was very happy with the service. 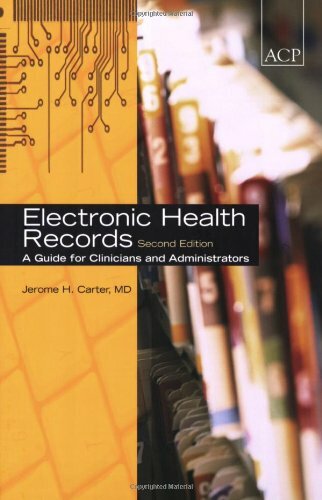 Dr Carter has created a well organized handbook that should become a professional necessity to both clinicians as well as folks in Information Technology. The last two thirds of the book is absolutely brilliant.It outlines in a clear workbook like format the process of doing a benefit / cost analysis; going through the selection process; key heuristics in finding the right consulting partner; managing change in the office; dealing with pain of implementation / startup and much more. Buy this book, skim through the fist 100 or so pages (unless you are a technologist and want to read what a physician has to say about operating systems and data repositories).From page 150 onwards, the book is a must read with every page giving you something to take home. Who says the Science Fair has to end? 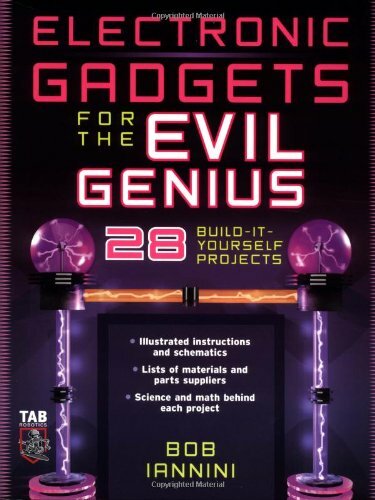 If you love building gadgets, this book belongs on your radar. Here are complete directions for building ten cool creations that involve light, sound, or vibrations -- a weird microphone, remote control gizmos, talking toys, and more, with full parts and tools lists, safety guidelines, and wiring schematics. 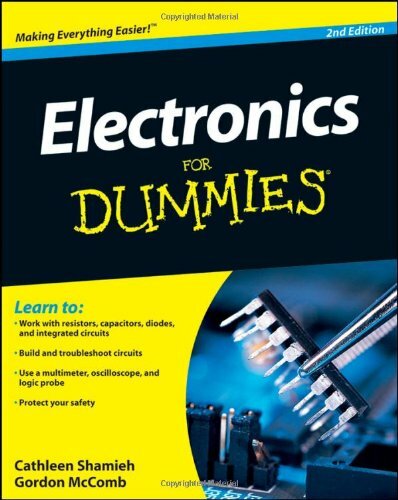 I bouth this book with Electronics for dummies. I think that both are excelent for beginners. I've built several of these projects, using the electronics but designing my own graphics and containers. The circuits are clear and function properly. I adapt them for soldered circuit boards and that works well. I'd recommend this book highly. AVOID if you wish to learn ANYTHING useful about electronics. I thought the point of this book, as the books Intro alludes to, was to learn the most simple and basic fundamentals of electronics through building the projects covered in the book.The back of the book says the reader will discover how to "Troubleshoot circuits with a multimeter" among other things but doesn't give us the knowledge necessary to do so. This book has a lot of shortcomings.Here's just one example. This book has only about HALF of a single page dedicated to resistors!For something so significant and "used all the time in electronics circuits" as the author states, there needs to be more coverage.What's more, the information needs to be INFORMATIVE and useful. To further illustrate... The author tells us that the measurement of resistors are "usually given in thousands (kohms) or millions (megohms) of ohms" and that resistors have colored bands that can be used to indicate their value.Instead of informing us how to interpret those values by looking at the colored bands or providing a simple chart (like another book that I have does), he tells us to "just read the packaging your resistor comes in or test it with a multimeter."UNBELIEVABLE!! !Imagine the potential (more like INEVITABLE) headaches that would be caused if you did things that way. Let's say a resistor accidentally finds it's way into the wrong container.You put a project together with that resistor, not knowing it's the wrong value, and end up wasting a lot of time in frustration trying to figure out exactly why your project won't work the way it's supposed to.Or worse, maybe even risk the possibility of damaging other components. Imagine you're doing an electronics project and you don't have a new resistor on hand in the value that you need.You do, however, have a scrap bin of old circuit boards taken from discarded electronics that you salvage components from.You believe there has to be at least one resistor in your bin with the value that you need.Imagine how much faster you'd find that component knowing that you needed a resistor with an orange, white, yellow then silver band as opposed to checking each resistor and playing the guessing game the author recommends. Giving bad advice like what I've just described is a terrible way to start off learning electronics.To give an analogy, a good piano teacher will instruct their students to use proper posture and hand/finger technique.Sure it would be easier for the student at this point in time to go the lazy route when all they're playing is Mary Had a Little Lamb and Row Row Row Your Boat, but as they advance to more challenging music that laziness is going to make things difficult for them and impede their progress.This isn't exactly a good analogy but it's obvious enough what the point is. IMPORTANT NOTE:If you have/buy this book and intend to do the projects, you'll need to visit the authors website where he has notations of mistakes that were made in the book.Some projects have missing components or ones that are listed with incorrect values.I don't recall exactly what, but the website lists them somewhere so be sure to find out what they are before you head out to the local electronics shop or place an order online for the parts you need. I'm a beginner in electronics with ambitions to really learn what makes electronic devices tick.Part of my learning strategy has been to start off with a few basic books to make sure I gain a solid foundation and have no gaps in the fundamentals before I attempt to tackle the more technical and pedantic texts.This book has sorely failed me.The favorable reviews are not accurate portrayals of this waste of paper. I feel like I bought an infomercial. There are too many plugs for the authors other book.If he doesn't teach anything worthwhile in this book and didn't live up to a fraction of the positive reviews on here, why in the world would I bother to buy his other one?Remember in the movie "A Christmas Story" when Ralphie gets his Little Orphan Annie decoder ring only to find that it's "a crummy commercial"?That's about what this book feels like to me. BTW - The photos are terrible.It's very obvious that most of them were haphazardly shot without any concern of how they'd turn out.Dark components on top of dark backgrounds, poor lighting, no attention to detail, etc. To sum things up, I'VE BEEN RIPPED OFF. If you're looking for an electronics project book, you might want to look into "Junkbots, Bugbots, & Bots on Wheels" by Dave Hrynkiw and Mark W. Tilden as an alternative. I have no affiliation with this book, it's authors, or benefit in any way, shape, or form by recommending it. Although I haven't completely finished it yet, I feel satisfied with the knowledge I've gained thus far. I am still searching for a book for REAL Dummies.. people who have never wired a circuit and who are still struggling with First grade concepts like "what is a volt, what is an ampere? How do I wire up one LED so that it will light up? Is it positive to negative or the other way round?" This book is not really for that kind of dummy. It starts you off with a project that involves about 50 resistors, integrated circuits, etc. It should not be called 'for dummies', but simply "simple projects for home hobbyists." Having learned to wire my single LED (from relatives and the internet), and thus discovering what resistors are all about, I want to build an equally simple circuit to discover what a Capacitor is all about. I am still looking for the first grade primer that will guide me in these basic learning exercises, but this book isn't it. This book offers no significant understanding of electronics or of the components used in it. 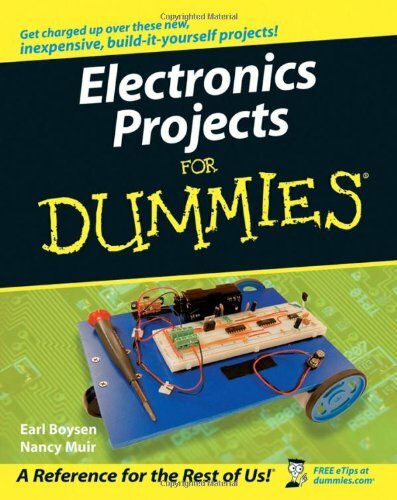 Rather than encroach on the sales of his co-authored book Electronics For Dummies, Boysen simplifies his book of Electronic Projects to the point of incoherence. There is some explanation of what a component is doing in the circuit, but the explanations are very brief, and there is no background understanding provided for comprehending the significance of the explanation. There is no discussion of current flow (negative to positive vs positive to negative) and of how current flow determines where in a circuit a component is placed. There is only a brief discussion on how to read and interpret a schematic, the discussion being on the meaning of the symbols. The authors spend more time telling you how to use a soldering iron than how to understand what it is you're actually doing when you replicate the schematic on the breadboard. As they describe step-by-step (along with photos) how to layout and wire the breadboard, they do not associate the procedure back to the schematic. Never do they say anything such as: "Now here in the schematic we see x occurring, and so on our breadboard we do y." They very briefly explain how a breadboard itself is pre-wired but do not refer back to that explanation during the initial projects to clarify what it is they're doing. A study of the second project, a parabolic microphone, a less detailed project than the first, allows an easy comparison between schematic and completed breadboard and will clear up any confusion for the reader - no thanks to the authors. This completed breadboard is shown early in the book, with components labeled, as an example of what a completed board looks like, and shown again in the chapter on its project. But they don't take the trouble to be helpful to beginners and mention the IC is oriented top to the left. But then, the only help they're really giving anyway is telling you what to do, not why you do it. There are no design tips, such as: "If you want a circuit that does x then these are the electrical conditions under which x would occur and this is how you might go about designing a circuit to make x occur." They don't explain how they went about designing the various circuits in their projects. Nor is there is any mention of any useful conventions or possible mistakes in drafting a schematic. When a sub-circuit (potentiometer/IC amp/speaker) is literally duplicated from one project to another, they don't point that out. This modularity is significant and they see no reason to mention it. An advantage of the book, I suppose, is that you don't have to understand electronics to follow the step-by-step instructions for building the projects in it. Just skip the explanation of the schematic, which is only marginally helpful anyway, and connect the dots the way they show. Another analogy is painting by numbers. This color goes here, here and here, and this other color goes right there and nowhere else. You might learn how to paint that way, but it's a pretty mindless way to teach it. There is a glossary but it is elementary. The entry for current is: "The flow of an electrical charge", with no mention of Ohm's Law, which the authors stated on page 19. If you look up Ohm's Law in the glossary you read: "The equation that you use to calculate voltage, current, and resistance, or power", with no reference to what the law says or where it is given in the book. There are 10 projects. The first project results in LED lights that react to high or low frequencies of sound, so you get a blinking light show. That's followed by a parabolic microphone, then a circuit designed around a programmable IC sound chip that's activated by pressure switches which they put in a doll. Finally at project 4 you get to see the schematic for an AM radio, the first project that interested me, but since most of the electronics for it is on an integrated circuit, there isn't much to learn from this project. Next we get two plastic pumpkins, one of which transmits an infrared beam to the other. When the beam is broken, the other pumpkin is activated to speak or play a recorded sound. This has applications outside of pumpkins, for an alarm system, of course. So this project has some appeal. Project 6 involves timing a collection of LEDs to create a sequence of images, which they call Dancing Dolphins. Next they control a little 3-wheeled go-kart via infrared, which involves an infrared receiver and transmitter like in the pumpkins, although in this case the transmitter is a remote control for the electric motor in the go-kart. After that you get a metal detector with a maximum sensitivity range of about an inch, then a project called Sensitive Sam, which involves a motorized cart that can follow, via sensors, a track on the floor created by black electrical tape, as long as the floor is otherwise shiny or reflective. With a radio wave remote you build you can control the cart's speed, honk its horn or turn it off. The last project, which should have been one of the first, is a small box that detects its own motion off the horizontal via a tilt switch, which activates a sound chip. It contains a microphone for recording into the sound chip. This project does not require a computer to get your voice into the chip. It uses the same chip used in the talking pumpkin. In fact, the schematic for this is a slight simplification or variation of that for the pumpkin that receives the infrared beam. The authors do not mention this similarity, and because the schematics have to accommodate the few differences in the components they require, they are not drawn so that they mirror the similarities between them. They're of little help in gathering the components for the projects. An appendix with a comparative chart of the components used in the book would have been helpful. They list what you need within a project's chapter, such as "100 microfarad electrolytic capacitor", which does tell you what you need in this case, if you can figure out how to find that in the huge electronics catalogs online, but there's no general suggestions about capacitors and resistors for future projects using AA batteries or other low voltage projects. If you want to buy in bulk they don't point you in the right direction: "Get a bunch of these, and these, and a lesser amount of these, and you'll probably appreciate a wide assortment of these, and you won't need any of these for a while but you might as well get one or two of these." They're no help whatsoever in choosing a multimeter: what features would be useful to a hobbyist and which are superfluous. If you want merely to learn how to assemble some simple circuits and don't mind not learning any electronics along the way, and you like the projects the book offers, then this book can suffice.In the final chapters, the authors give helpful suggestions of where to go next. Among their suggestions the only two books they recommend are: Electronics For Dummies by Gordon McComb and Earl Boysen, and The Art of Electronics by Paul Horiwitz and Winfield Hill. I think I'll pass on the Dummy book. 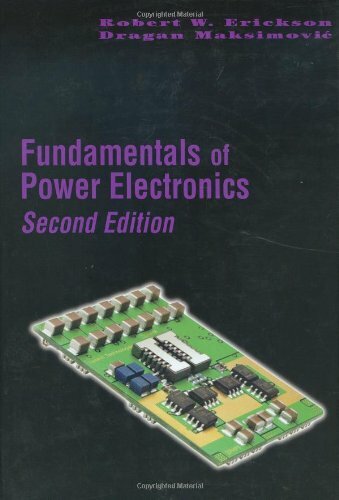 Fundamentals of Power Electronics, Second Edition, is an up-to-date and authoritative text and reference book on power electronics. This new edition retains the original objective and philosophy of focusing on the fundamental principles, models, and technical requirements needed for designing practical power electronic systems while adding a wealth of new material. Expanded treatment of current programmed control with complete results for basic converters, and much more. 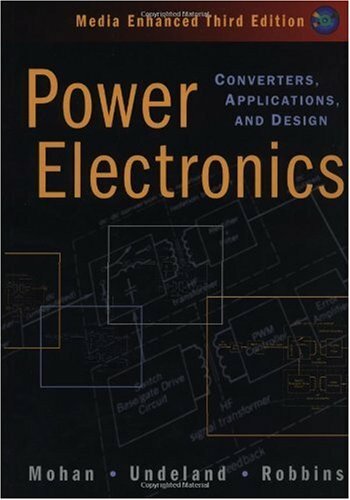 This is an excellent book teaching the basics of power electronics system design.It also helps because the author himself is teaching the course at UC Boulder. However, be careful of outdated pirated copies (Hardcover Chinese student editions) being sold on Amazon. The book is an excellent text for understanding power electronics and power supplies.My background is in analog circuits, microelectronics, RF, and high-voltage, and I found this book very easy to follow and extraordinarily thorough.The device physics in this book is a little thin, but not a concern to me. I would recommend Mohan's book for a more in-depth treatment of device physics or other device physics texts.Having already read half the book, I am currently in the midst of repairing a 14kVDC power supply for a radar system and this book made it very easy to troubleshoot and repair an inoperative power supply.I would highly recommend this book for someone looking to understand the inner-workings of power supplies, or power electronics in general down to its 'nuts and bolts'. I was very pleased with this book....it covers basic converter analysis, both in steady-state and discontinuous mode. Filters, transforms, inductances, and idealized / realistic switches are reviewed in detail. I have read many books that try to deal with converter or inverter analysis, and all have fallen short compared to this book. The authors keep the subject very abstract, and material is not presented from a math-heavy perspective (which I think makes reading very difficult). However, the material presented in this book IS in-depth and comprehensive. This is much less of a technology survey book than a serious, detailed engineering text. We jump right into transient analysis of switching converters, differential equations, frequency response plots, gain curves and other elements of hard-core engineering. If you want to know what components to buy off the shelf, this is not the book for you.If, as was my case, you are thinking of trying to design some power electronics, this is definitely the book for you. In the end, I hired one of the top power electronics people in the country. Largely thanks to having read this book I was able to understand what he was doing, and provide useful input to the design trade-offs we were making. I am a little hesitant to give this book 5 stars because it targets a very narrow audience, but I feel it does a great job of meeting the needs of that audience, so 5 stars it is. I think the author of the 1-star review does a good job of explaining who this book *isnt* for. I am happy to offset him. All-inclusive introduction to electricity and electronics. 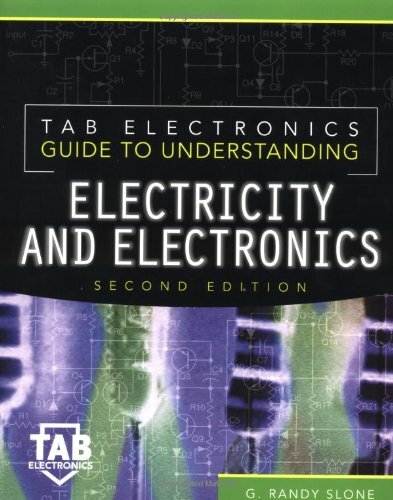 For the true beginner, there's no better introduction to electricity and electronics than TAB Electronics Guide to Understanding Electricity and Electronics , Second Edition. If your goal is to put together some simple circuits as described in a book, in tutorial fashion, it serves that purpose reasonably well.If your goal is to develop the understanding and analytical thinking to eventually hack your own projects, there are better alternatives out there (e.g., Art of Electronics by Horowitz and Hill). Chapter 6 is where things get hard. I hit the wall at this point. The theory and usefulness of transistors is not explained well and is difficult to understand. Diodes, okay; transistors, not. Collectors, emitters, base? PNP vs NPN? I've read this chapter three times and still don't feel comfortable with these concepts. And understanding much of the rest of the book -- anything not related to digital electronics -- depends on mastery of this. The rest of the book is satisfactory and some of the projects are actually rather illustrative and cool. Unfortunately, I'm afraid that I'm going to have to buy a second reference book in order to get over the transistors hump. This could be the nature of the subject matter, I don't know. Nonetheless, it's my hope that chapter 6 will be rewritten for a future edition. First of a disclaimer that I had a A.A.S and a B.S. in electronics engineering technology.That being said I did not use them as I am a system administrator by profession.I recently got my amateur radio license and had shell shock at the price of transceivers (even kits) so I wanted to build my own and needed a refresher course in electronics. I found after reading this book that I understood things that I only memorized in school. The book is very light on math and that is how it should be for the intended audience.I strongly disagree with a previous poster about how electronics is mathematics.Most components we work with have 5% tolerances, electrolytic capacitors 20% or more tolerance.If exact numbers mattered NOTHING would work. It is far more important to understand the path current will flow and be able to do seat of your pants figuring on voltage and current ratios between different paths than it is to get an exact number. Anyone working on ultra high speed digital buses or RF stuff and who is reading this book, obviously aimed at beginners, is just trolling for something to complain about. In college I was taught electron current flow in all my classes throughout both degree's and was told that conventional current flow was the old way to think about it. Being I don't work in the field I do not know if this is true or not but I do know that I strongly prefer electron current flow. All in all with my background I was able to make it through this whole book in a few days BUT I was shocked at how much Understanding I truly did gain especially on transistor action and how transistors work. Basically this book covered most of what I learned in my associates degree minus some of the math. The stuff I learned in my associates degree I have been able to practically apply to the real world.My B.S. on the other hand was almost all laplace transforms and transfer functions and I have never once been able to use any of that. Anyways this book was perfect for what I needed. Yes the math is almost non-existent but that is not a bad thing. Learn it when you need it and you will then understand why your learning it and remember it otherwise you will end up just memorizing formulas like I did. "If you wish to pursue higher mathematics, true power is calculated by finding the apparent power, and then multiplying it by the cosine of the differential phase angle.For any purely inductive circuit, the differential phase angle is 90 degrees.The cosine of 90 degrees is zero.Therefore, zero times any apparent calculations will always be zero. If you don't understand this, don't worry about it.Depending on your interests, you might never need to perform these calculations, a good electronics math book will explain it in easy detail." This pretty much sums up this book.Electronics without mathematics.What a concept.This book is written for people who basically can't handle any math at all.The problem with this notion is that electronics is math.If you can't do math, you cannot design electronics.You can of course pick up a soldering iron and build a circuit that you found in a book, but if you want to understand anything at all about electronics, this book is virtually a waste of time and money.The chapter on passive filters explains only in a cursory way simple 1st-order filters, and there is no mention of phase in this chapter.Where reactance is discussed, it is inane.Complex number calculations to not appear anywhere in the book. The book is more about doing electronics than how to build a work shop. He covers what insruments you need in the order of importance and how to build simple test equipment that you may need. 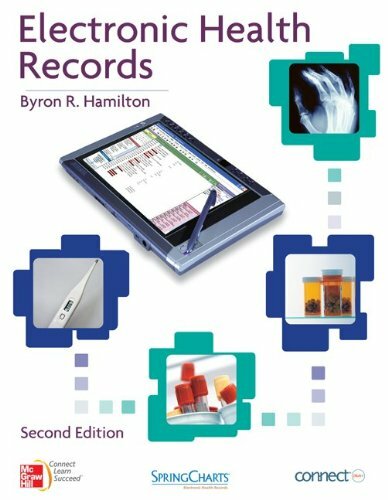 In general there is a chapter about each major piece of test equipment and how to use it. There is a similer chapter on tools. The main concept is how to build new electronics and how to repair electronics. I think the equipment you need depends on what type of work you expect to do, thus some of the recommendations may not not apply to you. For example, you do not need a giga hertz range oscilliscope or signal generator if you are not working in the ultra high frequency range. The complexity of electronic equipment increases with the increased frequency involved. For a person new to electronics, I suggest that you begin with low or audio frequencies, and progress upward to about 5 megahertz first. Your equipment is much less expensive in that range, than much higher up. 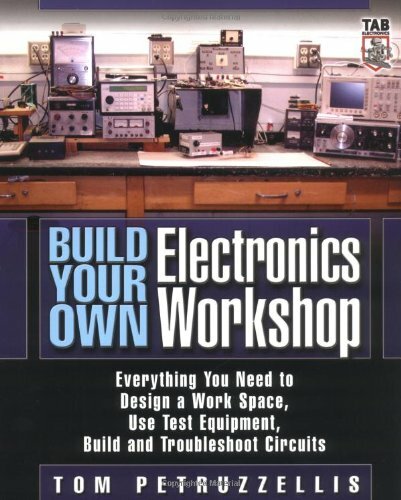 Overall, I found this to be a helpful book as I try to re-kindle my interest in electronics after many years away from the hobby.It contains much good information and a great deal of detail with respect to setting up a home electronics workshop.In addition to suggesting commercially available products it also offers plans and parts lists for home built testing equipment.It would have been more useful if the author had provided PCB diagrams for the various projects outlined or a least a source for these boards. My major complaint is that the book needs some serious editing.I have not read the whole book yet, but I have come across several sentences that were clearly overlooked in the editing process. Parts of the book are needlessly repeated almost word for word from earlier sections.The whole book is in much need of a critical re-editing and corrections. Apart from these problems I did find it a helpful and useful addition to my library of electronics books. I am an amature in electronics and have been waiting for this book to hit the book stores.I finally picked up a copy.I like the subjects covered.The content on at least some subjects leaves a little to be desired.There is a lot of verbal descriptiion but diagrams would have been helpful when discussing how to use controls on an oscilloscope, for instance.A fuzzy photo of an oscilloscope is shown, and then a detailed discussion is presented of how to use various dials, buttons and so on without any diagram showing where these controls are on the oscilloscope.Similar problems of what waveforms should look like without any diagrams, or photos of how they appear. I am particularly concerned about the description of how to build your own waveform generator.A discussion of how to do this is given along with a parts list.A photo is then shown of the "assembled function generator".However, the photo shows that this is really a Canakit(www.canakit.com) funtion generator.No credit is given to Canakit for this photo and the Canakit does not appear to be the same assembled function generator as the one described in the text. Unfortunately, the author does not wish to be contacted about any questions about what he has presented in this book, since he has given no method of contacting him.A brief search of the WEB did not show any way to contact him. I realize that writing a book of this size and range of topics is quite a labor, and I will try to get any missing info from other sources. The new edition of Electronic Principles provides the clearest, most complete coverage for use in courses such as Electronic Devices, Linear Electronics, and Electronic Circuits. Following the rave reviews, I picked up that book (6th Edition). Not that I am a beginner in electronics, but I wanted it as a beginners reference that would remind me of some of the basic concepts that I may have forgotten since my electronics course in college. The book definitely has many positives. It is well laid out, the graphs are beautiful. It is visually appealing. As for information it seems accessible in many places albeit sometimes oversimplified. The main issue is that the explanation isn't always clear and doesn't always drive the point home. I give you too examples. When talking about AC analysis ofamplifiers, I wish the author had taken some time to explain the concept of superposition. Not that I didn't know it from Circuit theory. But the fact that it is at the heart of AC analysis, makes failing to mention it at the very beginning annoying. I remember that this was one of my biggest confusing parts about AC analysis. Why do we short circuit DC sources in AC and open caps in DC. He only mentions superposition in passing later, and definitely had this been my first book I would have been through a lot of confusion. He also kept on using the term "AC ground" without explanation. I can imagine a beginner would be very confused, thinking that this is a real ground. In reality, it just means constant voltage. He also never explains that the premise of this analysis and that the use of superposition is based on the assumption that the transistor is considered a linear device in this case even though it isn't but we try to approximate it that way. I remember back in my college days, I would try to always think of the transistor in terms of transistor curves and exponential equations. Had anyone explained to me that I shouldn't bother and just assume the transistor is linear, it could have saved me a lot of agony. You see my point? He says things, throws terms, but he doesn't always get to the heart of it, neither does he address all the things that were confusing me when I was starting to learn the subject. That's why I'm saying it's a good book, but it is overrated because a great book would have addressed these confusing matters. Another example is when I opened up the JFET chapter since I have good background on MOSFETs but didn't remember much of JFETs. He has some good explanation in the beginning but I really disliked his discussion on biasing. Forexample on page 432 he would say "Since VGS is a negative, the source voltage will be slightly larger than the gate voltage". Says who? why? no explanation. I don't think the second part of the sentence necessarily follow from the first part. Also equation 13-12 is not explained where it follows from. Well it's kind of late night and may be I am slow, but I just think it's not well explained. Aside from all that, you have full page examples that asks you to divide or multiply like it is an arithmetic problem. You have the equation, a few numbers, and all you mentally need to do is to substitute numbers in the equation. I do not really know what purpose that serves aside from making the book bigger, especially when the example comes right after the equation. No insight gained nothing, just plain substitution. Of course I can't pinpoint every single shortcoming that I saw for lack of time, space, and mainly because I haven't read the book cover to cover, just picking chapters that I feel I want to brush up on the material in them. So do you believe me when I say overrated? I used this book extensivley as a practising electronics engineer. If you dont like this book, you wont like any book ever written or to be written. This book helped me get a patent!. Believe it or not. After several attempts in the early '80s to get into electronics (which included reading several electronics books and enrollment in a correspondence course for electronics technician), I was in a world of hurting and frustration trying to make sense of what I was reading and learning in electronics. Then, one day I happened to catch a glimpse of the textbook of one of the students of an electronics school in San Francisco in 1984. It read "Electronic Principles." I hurriedly went to the closest bookstore downtown and purchased one. I didn't even know about this book, but it was a risk I had to take. I just wanted to learn electronics. It was one of the best decisions I have ever made in my life. Because of Dr. Malvino's book, a whole new world of electronics opened up in front of my eyes. That book was so easy to understand and the numerous examples, diagrams, and troubleshooting problems and tips only reinforced the learning process. I have never read a book that explained the theory on transistors like this book has done; a truly remarkable, detailed, yet crystal clear explanation of operation and design of transistor circuits. The knowledge that I acquired from reading this outstanding book, helped me in my career in the military (mechanical maintenance which included some electrical and electronics systems)for the next twenty something years. 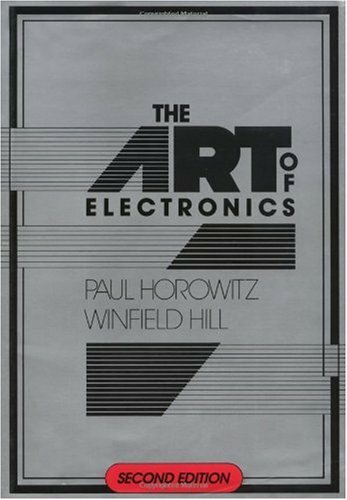 Without this book, I would not have pursued such a strong interest in electronics. My most sincere gratitude to you, Dr. Malvino. I still have that 3rd edition on my book shelf, always ready for quick reference. Now that I am about to retire from the military, what would be a better way to enjoy retirement than rekindle my electronics interest. Yes, I had to buy a more updated edition of Dr. Malvino's Electronic Principles book: the 6th edition. As I expected, this book made the mark. Like my old trusty, 3rd edition, it is very easy to understand, and it just makes you want to keep on reading it. 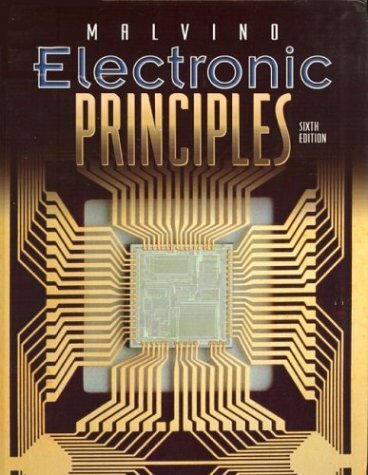 An advice for anyone who wants to learn and enjoy electronics without brain torture: Get one of Dr. Malvino's "Electronic Principles" books, and read and learn it by heart. You will not get disappointed. I'm just teaching myself electronics in order to be able to understand and design circuits for musical analog synthesizers, a new hobby I took up a few months ago.As an engineering professor (albeit, thankfully, in a totally unrelated field) I have access to an excellent university library, and I checked out a bunch of basic textbooks on electronics, including Malvino's 3rd edition (1984).This book absolutely blows me away.Anyone who works through this book from cover to cover will learn electronics, almost in spite of himself!I started by trying to work through Horowitz and Hill, but I just wasn't getting it.Then I went back to Grob to brush up on some basics (most importantly, dc and ac theory, reactance vs resistance in particular), and then graduated on to Malvino. Everything which is unclear in any book you've ever read on electronics is rendered clear and simple in Malvino.The chapters on biasing transistors and coupling and designing simple transistor amplifiers stand out for me in particular for taking a subject which is typically only glossed over in other books and breaking it down to its basic fundamentals, each step illustrated by a nice example, and reinforced with several back-of-chapter problems (with answers to the odd-numbered ones provided in the back of the book -- how about that, Horowitz and Hill?!?!? -- what good are practice problems if you don't know whether you obtained the right answer or not?!?!?). Just wanted to say that the book I ordered was just as you described. Thanks for saving me so much money--buying from the bookstore is outrageous! Very fast shipping got pakage with in 3 days of order, book was in condition as advertised. Would definetly buy frm this seller again. Almost exactly 1 month ago (7/23) I purchased a school book online (standard shipping)for a class that will begin on 8/23. The delivery date was supposed to be 8/16.On 7/23 at 10:23am I received an email confirming IntelliTech IT/AV Solutions shipped the item.Since 8/17, I have emailed this company twice through Amazon to find out where the order was since there does not seem to be any tracking number on this order and no way to contact them directly.I have never even received a response to either request!Customer service? !PUH!This company and their customer service STINKS!I want my money back - yeah, they charged my account the day I purchased the book online.I have purchased several things on Amazon before with no problem whatsoever but this has really discouraged me from going this route again. I haven't used this book yet.I actually don't have a option on this yet.This book is used for a class that I will be taking mid July. For both physics and electrical engineering undergraduates alike, the one to two semester courses you take in electronics shall probably be a difficult transition regardless of how well you did in your circuit analysis course. This is largely due to the fact that nobody tells you WHY this subject is important (to produce nonlinear transfer functions & to perform power amplification- neither which can be accomplished with RLC circuits), or bothers to show you sufficient examples so that you can perform designs of your own. This Schaum's outline is an excellent companion to all of those electronics textbooks that are failing miserably. Other reviewers are right- as a practicing engineer you will probably never be called upon to bias a transistor to get a specified gain, or several other of the basic tasks that this outline goes over in detail. However, you won't be able to graduate until you master these techniques. As an example of its usefulness, I got a B in my first semester of electronics years ago, and for years I could not have told you the first thing about what went on in that class.It seemed that the students that really did well were part magician and part TV repairman. I bought this outline to learn what I should have mastered back in 1979, and the book made me understand the circuit design techniques involved plus brought me up-to-date in design and analysis techniques. The outline does not talk about the semiconductor physics of electronic devices. Instead it concentrates on design techniques for circuits that incorporate the diode, BJT, FET, and operational amplifier, which are crafts you must master. 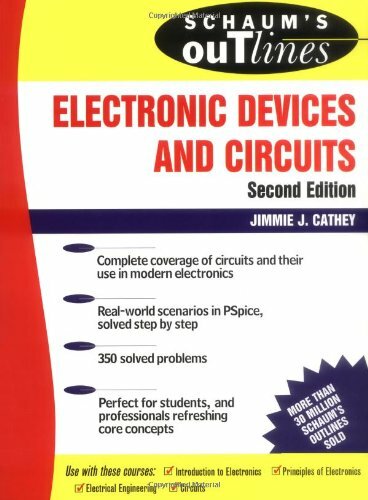 Included in this outline is how to define an electronic circuit in PSPICE and the last chapter incorporates all you have learned throughout the book into the analysis and design of a switched mode power supply. I highly recommend this book as a supplement to undergraduate electronics textbooks. It's always interesting to see how authors attempts to fill those niches between basic DC/AC circuit analysis with passive components and analog (linear) circuit design/analysis with active electronic circuit devices. Discounting the fact that this is, after all, an outline on the subject written as a supplement to your text, I'd give it a C+. About 75% of the book is dedicated to diodes and transistor (all types) amplifier circuits. This is basic resistor biasing, find a load line, and establish the Q-point, kind of stuff. If you're studying to become an analog circuit designer, it is unlikely that ever, in your life, will you be called upon to design such a discrete transistor amplifier; however, this is a "row you'll have to hoe". So if you find yourself in the middle of a blizzard of transistor symbols, parameters, models, characteristics & configurations, this may be of some help; it's no silver bullet. It would have been nice to have seen some introduction to 1) semiconductor physics, 2) current source biasing, 3) oscillators, 4) basic power supplies, 5) data conversion and 6) integrated circuits and etc. Best help will be found in 1) DC and small signal examples of BJT and FET transistor design, 2) transistor modeling, 3) better than average SPICE examples, 4) and working with semiconductor parameters. There's a brief introduction to OP Amps and Switching Regulator power supplies. I didn't see a lot of errors and, with most Schaum's Outlines, there are plenty of practice problems. If you are still looking for help, try looking at some of the books written by Thomas L. Floyd. One hardback - "Fundamentals of Linear Circuits" - now ten or more years old, can be picked up on the used book shelves for about what you will pay for this outline. His books that I've seen are more for the ET than the EE, however if you're looking for another down to earth view of basic analog circuits, I suggest you check it out. This is my first ebook, and it may be the last for a while. I was able to download the ebook from Amazon without trouble, but I was not able to transfer the ebook from one computer to another, because I couldn't get my Adobe Reader 6.0 activated. Unfortunately, I used my desktop computer to download the ebook, because it is connected to DSL. What I want is to have the ebook on my laptop (not connected to DSL, though), so I can read the ebook at work. The good news is that this ebook didn't cost very much. I also don't think this is Amazon's problem, but they happen to be the messenger. So far I have read one page of the book, which is not neither good nor bad (meaning 2.5 stars). One of these days I'll get a hold of a hard copy and read the entire book. This is another of several books from Forrest M. Mims III . Always great, always correct information on what ever he publishes. You cannot go wrong, and it is a Great buy. This book is a great little book for reference when working with circuits.I would highly recommend this book to anyone who needs an easy reference to some very basic circuits. Contains a decent amount of handy formulas used in electronics. Great assistant. A must have book. I forgot most of the formulas I learned years ago in Tech School. This is a super handy reference and I would recommend it to all Service technicians or hobbyists that want the most out of their designs. Hipps, previously a strategic advertising planner and now a missional pastor, draws on and applies Marshall McLuhan's media theory to current issues of church, gospel and culture. McLuhan asserted that `the medium is the message' and that content is less important than the way it is conveyed: `The content or message of any particular medium has about as much importance as the stenciling on the casing of an atomic bomb'. 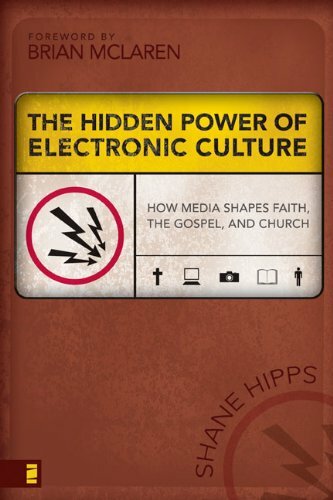 Hipps explores how electronic media - radio, film, television, computer and internet - change the ways we think and influence how we express church. For example, he suggests that electronic media enhances corporate approaches to faith and reliance on experience of God and retrieves contemplative spirituality and the centrality of the gospels' stories of Jesus. But it can also reverse into relativism and downplay critical reasoning and make obsolete metanarrative, conversion and propositional faith. He traces the influence of electronic culture on evangelism as dialogue and conversion as process. Not prone to uncritical acceptance of new technology, he warns against the superficial danger of blogs and the risk of consumer-driven megachurches. He celebrates the rhythm of praxis (action AND reflection), decision-making by consensus (if properly orchestrated) and emerging worship (as long as it maintains a missional community). The best emerging approach is to innovate from the inside out (like the Mac operating system) rather than just making cosmetic changes with the same foundations in a pragmatic attempt at keeping up (as Windows did). Churches ready for the `Mac approach' that Hipps prefers will start with a postmodern theology of church and allow the methods and message of the church to be transformed in order to answer the cry for experience, story and community. Originally reviewd in 'The Emerging Church: Spirituality and Worship Reading Guide.' Zadok Papers S159 (Autumn 2008). Shane Hipps' desire with this book is essentially two-fold.First, he wants to take a serious look at the effects of media technology in the lives of believers.Secondly, he works to take that analysis and apply it to the life of the church. Using the powerfully prescient McLuhan as his touchstone, Hipps proceeds to remind us of the truth that the "medium is the message" and the subsequent analysis provided by McLuhan to help us understand the impact of any technology.Hipps moves fluidly from oral to written culture to projected sermons in video venue church services.As such, I think Hipps does a good job of reminding us of some very important reflection - the kind of reflection we so rarely do as evangelicals.At times Hipps is insightful, at times he is appropriately biting in his critique, but most of all the first half of the book provides analysis that needs to be heard.We live in a technologically saturated culture, and hence we tend to lose our ability to "step out" for a moment and think through whether it is any good for us or the message of the Gospel. Where the book begins to lose its impact is the second half - the application to church culture.Several problems become fairly obvious as the book progresses.I was personally disappointed to discover that Hipps is squarely in the emergent theological fold.I know his book is endorsed by leaders in the emergent movement, but that didn't necessitate the theological problems with Hipps' analysis.As is becoming almost stereotypical of emergent writing, Hipps' history, philosophy and theology are rife with straw men, hyperbole, and unkind generalizations. For example, Hipps simply assumes that epistemological foundationalism is dead.It isn't.The result from Hipps' point of view is that church life needs to look more at a "web of belief" way of presenting the Gospel, but that is not free from its own serious problems.If the foundation of your argument is a broad generalization, your conclusion is bound to suffer. Hipps argues against the cultural captivity of seeker sensitive style churches and the prevalence of modernism in too many evangelical circles.Though this is true in some places, the emergent point of view has painted with a very broad brush and pigeonholed every church that doesn't look at things the way they do.Ironically, at this point Hipps falls into the same trap as so many emergent authors - while accusing the modern church of cultural captivity they have willingly become captives to a postmodern culture. And then there are the ad hominem attacks.Hipps is not above mocking the "30 minute lecture" style of preaching or stating that top-down leadership models "inevitably" lead to corruption and abuse. I'm growing tired of hearing these kinds of obviously false and unkind generalizations from emergent authors. Hipps' personal narrative is compelling and his work in McLuhan's theory is a great reminder for us, but the book would have been a lot more persuasive with better application to church life. I have been doing teaching, research, and writing in the field of Internet ministry for several years now. This book, in my opinion, is one of the key texts that must be studied by anyone who wants to use technology as a way to share their faith.I used this book as required reading in my "Internet ministry" class last year and it will be required again in my summer 2010 online course. The author of this book, Shane Hipps, takes a look at how the church has tried to see technologies such as radio, TV, and now the Internet, as just another tool and that as long as the "message stays the same" then the medium used to transmit it does not matter. This line of thinking has led the Church to embrace all technologies and not consider how the use of the technologies themselves send a message. Hipps does not say that technology is bad, only that we need to be informed about how the use of a technology can change our message. One recurring example that he uses in the book is the differences between the writings of Paul and the gospel narratives of Christ's life. When the medium used is print, the logical and complex thinking of Paul is best conveyed, allowing us to study and understand it. However, as the medium moves back towards images (television, Internet), the stories of the gospel are more easily conveyed.Think about it: can an image be used to convey some of the complex theology of Romans? No, but an image can easily help us understand part of the story of Christ (think about a picture of the Last Supper or of the parable of the Good Samaritan). For more info on Shane Hipps, see my video interview of him at my web site, [...]. Go to the "Resources" page. Hipps offers a great history lesson and how it has impacted not only secular culture, but the church in particular. He does so with a humor and conciseness that will affect any reader. A great introduction to postmodernism and its effect on media and the world. In reflection on the relationship between media and social organization, Shane Hipps explores the emerging church's engagement with electronic culture.For instance, Hipps outlines some basic associations with the individualism, objectivity, and abstraction of modernity and the print medium's encouragement of private reading, detached learning, and abandonment of mnemonic practices - respectively.Print culture can seem to give shape to a Christian privatized worship life and a systematic scripture reading of "extracting propositional truths." The author draws heavily on the thoughts on Marshall McLuhan, and offers valuable insights into the role of communication technology in culture.However, after reading this book one wonders if the author puts too much explanatory weight on media technology regarding social organization and related issues.It must be noted that there are other factors which can help explain our systems of thought and social organizing.